8.5″x10.5″ mixed media painting on paper. 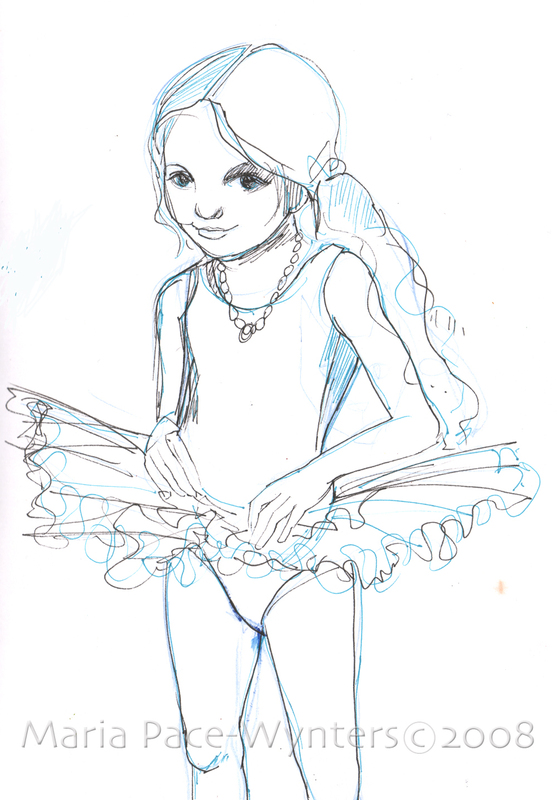 This is a drawing of Imogen in her Tutu from my sketchbook. When we were in Victoria we bought a fairy dress and a tutu for the girls and the night before we flew home we put some music on and let the kids dance around. I was laughing so hard at them all and the way Scarlett (2) was moving to the music. Then, if that wasn’t enough, my Mum put the Tutu on Matthew (2.5). It was so hilarious I was crying! He is such a boy and to see him dancing around in this delicate pink Tutu when he is anything BUT pink and delicate was so cute, but really funny as well. Poor Matthew, I photographed and video taped the whole thing. … BUT I’ll let you in on a little secret: he was just dying to put that pink Tutu on! Yesterday was Imogen’s novice ballet recital. She did a great job. Some of the older girls were so beautiful dancing their solos. I got all weepy about it all and then right in the middle of the show, everything was stopped and a teacher came out carrying a sobbing little girl. Her parents were called and when she saw her Daddy approach the stage her little body shook and she sobbed even harder with relief. That was just too much for me. Tears were streaming down my face. It would have been very embarrassing if it hadn’t been so dark in the theatre. How much time does a dancer wait in the wings? Certainly more time than actually dancing. I am sure it is true of a lot of things but I am so intrigued by the world of dancing right now that I couldn’t help but paint this.